Sacha Kljestan (left) leading the Red Bulls before a game last season. @NewYorkRedBulls. 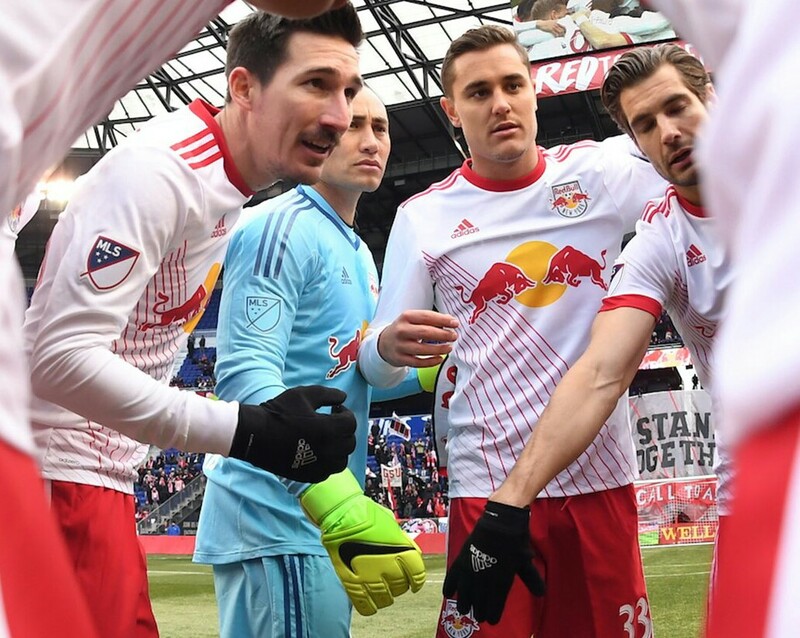 The Red Bulls made a somewhat surprising move on Wednesday, as they traded their captain, midfielder Sacha Kljestan, along with $150,000 in Targeted Allocation Money for the 2018 season, to Orlando City for forward Carlos Rivas and center back Tommy Redding. This is the second straight offseason that the Red Bulls have traded their captain, as they sent Dax McCarty to the Chicago Fire ahead of the 2017 season. Kljestan joined the Red Bulls in 2015, making the move from RSC Anderlecht in Belgium. He helped the Red Bulls win the 2015 Supporters' Shield for best record in the regular season and an appearance in the Eastern Conference Finals of the MLS Cup Playoffs with eight goals and 14 assists in 33 appearances. In 2016, Kljestan recorded 20 regular season assists, setting a new franchise single-season record and becoming just the second player in league history to reach the 20-assist mark. He was named captain ahead of the 2017 season in which the club reached the U.S. Open Cup Final and appeared in the MLS Cup Playoffs for the eighth consecutive season. Red Bulls Sporting Director Denis Hamlett said, "On behalf of everyone at the club, I'd like to thank Sacha for his three years with the Red Bulls. His career here was among the most productive of any player in team history, and he is a true professional on and off the field. We wish Sacha and his family all the best." "It's never easy to trade a player, especially one that has been as impactful as Sacha. That said, this move is in the best interest of our club now and for the future. We are adding two young, exciting players that have MLS experience." Red Bulls Head Coach Jesse Marsch said, "Sacha has been a massive contributor to our current club culture and team success. Saying goodbye to him is an incredibly difficult thing for all of us. He should be considered a club legend and has left a lasting impression on everyone. We wish him great success in the future and we know that he will always be a big part of this club." Overall, Kljestan recorded 22 goals and 54 assists in 121 appearances across all competitions. In 2017 he surpassed Thierry Henry to become the club's all-time assists leader. He led MLS in assists in back-to-back seasons, the first time a player has done so in league history. Rivas, 23, joined Orlando City as a Designated Player in January of 2015 from Deportivo Cali in his native Colombia. The attacking player posted career highs in appearances (30), goals (5), and assists (5) in 2017. In all, he made 78 appearances for Orlando over three years with eight goals and 13 assists. "Carlos is an exciting young player that can be a threat on the wing or as a forward," said Hamlett. "We think he is a natural fit for our team and immediately improves our attacking options." Rivas has appeared at youth international levels for Colombia. With Deportivo, he recorded seven goals and two assists in 20 league appearances as a 19-year-old, and added three goals between the Copa Sudamericana and Copa Libertadores. Redding, 20, is a native of Oviedo, Florida. He signed as the first Homegrown Player in Orlando City history in March of 2014. The center back has made MLS appearances in each of his three seasons, playing 18 matches in both 2016 and 2017. He totaled 38 appearances and 31 starts. In 2017 he recorded 55 clearances, 30 interceptions and 30 tackles. "Tommy is a player that we've kept an eye on as we watched him alongside our own Homegrown Players with youth national teams," said Marsch. "His size and skill line up with what we look for in a central defender and he has demonstrated that he can use both in his MLS opportunities." Like Rivas, Redding is also a youth international. He has represented the United States, most recently as a member of the U-20 team that reached the quarterfinals of the U-20 World Cup in May, starting two of the matches alongside Tyler Adams. Books: Shafransky's Debut Novel "Tips For Living"
Books: The Threat To Democracy From "Trumpocracy"
St. John's Shutdown In D.C.